As an of our regular readers will know we have been focusing this blog on our take of parenting over the past few years and reviewing various products and restaurants that are parent-friendly... Well... one aspect of parenting that's really important is taking care of yourself so you can be there for your child! That's one aspect of my life that I have been working on. That being said I realized that what I have been doing so far isn't working the best, so that's why I joined WeightWatchers and after the first week it is going in the right direction... It's a great start! Who knows... maybe it's also because I'm now addicted to these OP Smoothies and am having one for breakfast every day - much healthier and filling than what I used to eat! 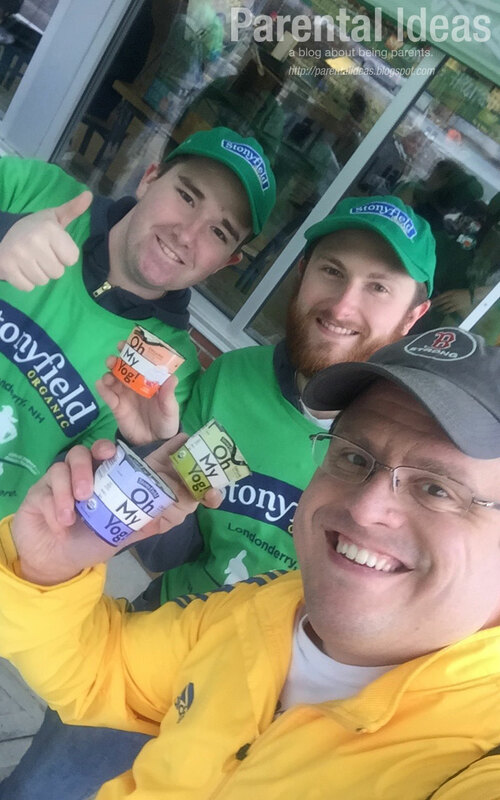 I'm also happy to say that after writing the post about the Boston Marathon and getting some Stonyfield samples and enjoying them, I reached out to the nice folks at Stonyfield and they agreed to have me host a giveaway for $20 worth of free Stonyfield coupons to one of our readers! So guys - enter away!!!! NOTE: There was no compensation provided in exchange for this post. After talking with the cool people at Stonyfield, they graciously offered to send coupons worth $20 to the winner of a contest on our website. They will be handling all of the mailing and such so the only thing we're doing is putting up a contest form, having you guys enter and win and they are doing the rest. Simple as that!! I'm interested in trying the vanilla one - it sounds delicious!